This entry was posted in Campus Announcement, Community, Events and tagged sustainability on September 17, 2012 by Wire Eagle. AUBURN UNIVERSITY – The Auburn University Office of Sustainability will hold a screening of the film, “Terra Blight,” Monday, Sept. 24, from 4:30 to 6 p.m. in Langdon Hall auditorium. The film’s executive producer, Ana Habib, and director, Isaac Brown, will introduce the film and participate in a post-viewing conversation about its message. 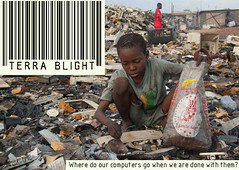 The 55-minute documentary traces the life cycle of computers from creation to disposal and juxtaposes the productivity and entertainment of electronics use with the reality of those who are on the receiving end of discarded electronics. Computers, cell phones, TVs and other electronics are filled with heavy metals. A typical computer monitor contains roughly seven pounds of lead. In addition, they contain other toxic materials including cadmium, mercury and brominated flame retardants. While perfectly harmless on our desktop, when thrown away, these antiquated electronics are classified as hazardous waste. From a 3,000-person video game party in Texas, to a 13-year-old Ghanaian who smashes obsolete monitors to salvage copper, “Terra Blight” reveals the unseen realities of one of the most persistent and widespread toxic wastes on the planet. The event is free to the public and is part of the Office of Sustainability’s Campus Conversations program. For more information, go to http://www.auburn.edu/sustainability/storage/Terra_Blight_email_announcement.html.